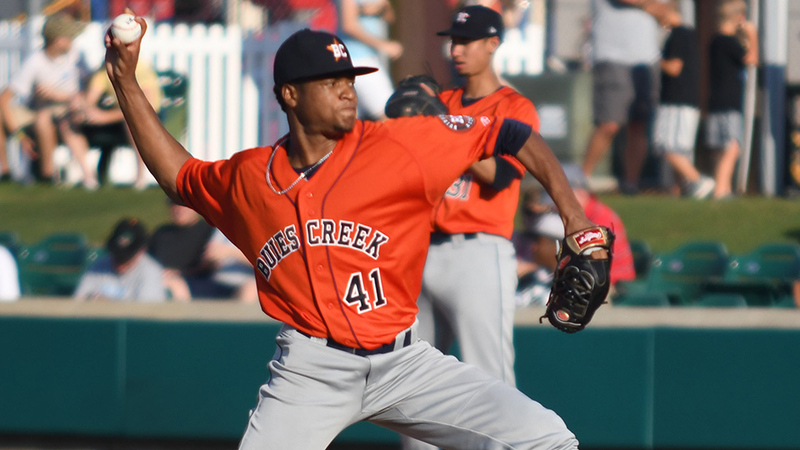 Class A Advanced Buies Creek starting pitcher Abdiel Saldana came into Monday night's action on a tear, while the squad's reliever Jorge Alcala -- one of the top hurlers in the Houston farm system -- was in desperate need of a boost. The pair combined for nine innings of near-flawless baseball, giving up just one hit in the Astros' 3-0 victory over the Pelicans at Jim Perry Stadium. Buies Creek pitchers haven't given up a run in the past three games. Alcala, Houston's No. 7 prospect, wound up a reliever in the rotation after two losses in two starts tarnished his first two weeks of the season. After a strong finish last fall, and after adding a curveball to his repertoire this offseason, Astros coaches had high expectations for the 22-year-old right-hander. The Dominican Republic native showed moments of promise, posting five strikeouts in three innings April 5 at Salem, but he was off just a touch, according to Buies Creek pitching coach Drew French. Through 4 2/3 innings entering Monday, Alcala sported an unwieldy 11.57 ERA. "His work has been good so far, but the fruits of his labor haven't showed yet," French said. "Today, he seemed more energetic, driven, focused. No one likes to [stink], and he didn't like the feeling of those first two outings. "The work was good, and that's hard with someone so young and new to the states. It's tough keeping him focused and on the right path, believing that the skies will become blue again." Alcala began firing on all cylinders Monday, striking out seven -- including the first four Myrtle Beach batters he faced -- without allowing a walk over four frames for his first save of the season. The only blemish on his line was the one-out line-drive single by Kevonte Mitchell in the eighth that broke up the duo's bid for history. "I didn't even know about it until we were hitting in the bottom of the seventh," French said. "But [Alcala] had that same look and energy. Nothing changed, which was good because giving up that one hit when they know it can derail them for the rest of the game. No one mentioned it. That was good savvy by the team." The pitching coach said he was more impressed with Alcala's clean slate of walks. "We know he's going to strike guys out and has power stuff," French said. "But he needs to eliminate walk numbers to show he can compete in all circumstances." Meanwhile, starter Saldana has yet to give up a run in 14 innings this season. The 22-year-old righty retired his first nine batters, while his teammates tacked on the only run they needed two batters into the game on an RBI double by Josh Rojas. Abraham Toro and Chas McCormick also knocked in runs for the Astros. Saldana walked D.J. Wilson and Vimael Machin in the fourth within his first three batters, but promptly fanned Wladimir Galindo and Tyler Alamo to erase the only threat he faced over five frames. "He didn't punch out as many as we liked, but he's a dream strike thrower," said French of his starter's performance. "He hangs his hat on his pitchability and things other guys in A-ball at this moment can't do."